A processor twice as fast as the iPhone 6. A stereo speaker system two times louder than the iPhone 6s. A new camera for true to life pictures. This is the new iPhone 7. With the latest iPhone 7, Apple has taken the basics of what made the iPhone 5 and the iPhone 6 such great devices, and they have doubled down on this great design language. The Apple iPhone 7 improves upon said design language by leaps and bounds. Through their intricate design process and dedication improving upon greatness, they have created a phone that is like no other. Featuring the latest A10 Fusion Chip, a superior camera, and a jet black finish – something not seen since the Apple iPhone 4 – the new iPhone 7 is as formidable and powerful as it looks. With this new iteration, Apple has given the user what they need to consume as much media as they please. The improved battery performance coupled with the brand new stereo speakers allows you to watch your videos and listen to your music for even longer and at even louder volumes. Complement the iPhone 7 with Apple Accessories. Grab a beautiful casing, shop Apple through Shopback to receive a 1.0% cashback on all your purchases. Allow the Apple iPad to change your computing experience. The Apple iPad Air and the iPad Pro puts incredible processing power into a portable device that gives you everything you need at your fingertips. Pick between the 9.7 inch iPad Air 2 or the 12.9 inch iPad Pro. Both devices come with an unmatched viewing experience like no other. View every pixel of your content in remarkable detail, with the brightest and most striking display ever created for an iPad. Featuring the highest resolution of any Apple tablet you will ever miss another detail again. Enhance your computing experience with the groundbreaking Smart Keyboard for the iPad Pro. Through the magic of technology and design, we bring you the magic keyboard for the working professional. No wires. No cables. No pairing. Just attach the Smart Keyboard and let your fingers do the rest. Simplicity at its best. The iPad Mini 4 might be small, but do not judge this book by its cover. The new iPad Mini does not compromise on performance, while still being thinner and lighter than ever before. Coming in at just 6.1mm and 298.8 grams, this is one outrageously light device. With a 30% faster CPU and 60% faster graphics than the A7 chip that the iPad Mini 2 uses, you can be sure that the iPad Mini 4 will be able to handle even the most intensive app without a hitch. Carry around genius wherever you go, with the MacBook Pro from the Apple Mac line. Designed with the creative and professional community in mind, the Apple MacBook Pro is more effective than it has ever been. Please note though that the new MacBook Pro does not qualify for cashback. The new MacBook Pro gives you the most stunning and the clearest display on the market. It ensures that every video, every picture, and every detail is replicated to showcase the most accurate image possible. The screen has also been made to be as power efficient as possible, allowing you to view what you require to on the go, without worrying about battery life. Introducing the Touch Bar and Touch ID into the Apple MacBook Pro will transform the way you function with the device. The Touch Bar opens up a new realm of possibilities when it comes to productivity. Changing according to what you are doing, the Touch Bar makes it possible to achieve maximum efficiency, even without an Apple Mouse. By creatives for creatives. Do more while on the go with the Apple MacBook Air. Light does not mean lightweight. The MacBook Air packs a heavy punch when it comes to doing what you need it to. MacBook Air allows you to create when you’re out and about, thanks in part to the magic of the Apple trackpad. Working hand in hand with the Apple keyboard, you can type, swipe, and scroll away with ease. Increase productivity with an Apple Magic Mouse – it gives you the flexibility you need, while still being a small, compact and portable device that complements your MacBook Air without compromising on quality. Give yourself an unrivalled and incomparable desktop experience with the Apple home computing line. The Apple iMac provides the ultimate desktop for power users. Built for those who consume and create, the iMac is a glorious culmination of design and innovation. All that raw processing power is enclosed within an incredibly thin and durable metal casing, with a giant and beautiful built-in Retina display. With two graphics cards, state-of-the-art Xeon processors, and up to 64GB of memory, let the Mac Pro change your perception of what you can do with a desktop. The Mac Pro allows for the creation necessary to change the world. Adorability yet powerful comes in a small package with the Mac Mini. All you require is a display, a keyboard, a mouse, and this wonderful device, and you’re ready to go. The Mac Mini does what you need without being overbearing or unsightly. Boost your desktop experience with the Apple Magic Trackpad. The Magic Trackpad brings along with it the much-wanted Force Touch feature. This subtle yet important change amplifies the way you work, giving you a chance to connect with your content more than ever before. Looking for more Apple products and services? We’ve got you covered. The iPhone SE is available on the Apple Online, with a 1.0% cashback available if you purchase it though Shopback. However take note that cashback is not applicable to the new MacBook Pro and Apple AirPods, gift cards, gift wrap, One to One Membership, Bose products, shipping and orders made during pre-order period. Compliment your new iPhone with the progressive Apple Music. 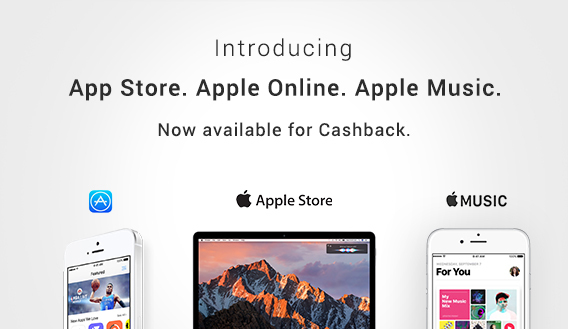 For all your application needs, shop the App Store though Shopback, and get 5.0% cashback on all app purchases.